Previous lure reference books listed the founding date for Creek Chub (CCBCO) as 1906 although researchers could never find any trade advertising, company brochures or catalogs from this period. Recent research has confirmed a much later date of inception. 1916 is the year this company began official production on the first lure model, the Wiggler. This enterprise was the brainchild of three men who lived in the sleepy northeast Indiana railroad town of Garrett. This hamlet was actually founded by the B&O railroad which needed a supply & repair shop on a new rail between Willard, Ohio & Chicago, Illinois. The town was incorporated in 1876 & named after the president of the B&O. Henry Dills (1872-1927) was the inventive genius of the three men who formed the new lure company in 1916. He was an employee of the B&O Railroad. He also experimented with new wooden lure designs in his spare time & finally found a type he was convinced was good enough to market. However he needed the business acumen & cash infusion of partners to make the project a reality. A testament to his inventive mind is the novel idea of a metal lip that moved side to side allowing the lure to wiggle in the water. The angler also had the option to reverse the lip for a surface bait. Henry also received a patent in 1919 that hasn't brought the attention it should. It was a process to paint a fish scale pattern on lures by spraying paint through a fine netting similar to a wedding veil. This one simple patent would have an incalculable value today if one company owned it in this multi-billion dollar market. Soon after it was patented, CCBCO sold the rights to share this process to Heddon for $1.00! Why? Heddon was already a behemoth in the angling business. They could afford to protect the patent in court while tiny CCBCO couldn't. In fact that was one of the conditions of the transfer. The second partner was George Schulthess (1873-1945). He moved to Garrett c.1881. He eventually became a successful entrepreneur dabbling in real estate, taverns, farming & much more. George was also the city mayor. He loved politics & was involved in this arena in one capacity or another most of his life. Eventually he became the head of the shipping department at Creek Chub. Legend tells us Henry visited George at his fishing cabin on Lake Wawasee in Indiana. Together they fished with the new bait & had excellent results. Another friend, Carl Heinzerling, owned an adjacent cabin & was convinced to become a partner also before the fishing expedition was over. Carl Heinzerling (1881-1950) was another local businessman who brought his unique talent & cash to the table. His family moved to Garrett in 1892. He eventually became involved in the hardware business & owned his own store for decades. His time was split between the hardware business & CCBCO until his son began working at the store c.1930, allowing more time for Carl at Creek Chub. He was very active in the community, becoming involved in many business & fraternal associations. He also loved to experiment with new lure designs such as the Plunker & others. Although this shouldn't be dismissed, his most important contributions are said to be on the management side of CCBCO. Together they began production of their first bait, the Wiggler. It wasn't long before they expanded into many other designs. The company's success jumped in quantum leaps over the next several years. Similar to so many other start up companies, the genesis of CCBCO evolved from a humble beginning. Some descendants say production unfolded in the basement of George Schulthess. Others explain the first shop was in a building that eventually became the post office. Whatever the case, they soon moved again to a building previously known as the Garrett Hotel Annex, their base of operations for the next 60 years. At one time, some of the lure prep work was completed at other shops in & near Garrett. In fact another company was formed by Creek Chub, known as Lures, Inc. The new company first operated in another town but was moved to Garret. At its peak about 85 employees worked there. They did all the prep work on lures, leaving the final painting, assembly & shipping to the mother company. The whole operation was a community effort. Obviously, the employees were local. Women were hired at Creek Chub to do the tedious work including the excellent lure painting & other finish work. It's amazing that a small company with a work force that ranged at its peak from 45 to 115 employees (depending on which source one reads) would become world famous in the tackle business. Many generations of families worked at the company. Descendants of the founders were also employees & several were on the board of directors. The company also employed several traveling salesmen that introduced the product to buyers in the trade from coast to coast. Eventually lures were sent to many countries throughout the world. CCBCO survived the Depression, many recessions & several wars. Their inventiveness and innovations brought them from a one-lure company in 1916 to a major player in the market by the 1920s. In 1924, a host of new designs were added to their line. By the late 1920s, catalogs were about 50 pages, a far cry from the 1916 one page flyer. One of the great success stories was the Pikie design first offered in 1920. It was basically a cigar shaped lure that received rave reviews from anglers. Over the ensuing years CCBCO sold 40 to 60 million Pikies (depending on which story you believe) in one piece, jointed two & three piece bodies. The sizes ranged from tiny fly rod baits to huge models for saltwater fish. Some sizes were made until the company closed in 1978/'79. Creek Chub capitalized on the fly rod boom of the period by introducing several fly rod baits in 1922. As time passed many other fly rod types were added to their inventory. During the 1930s CCBCO realized their first line of quality baits, which were expensive to produce, were too pricey for many anglers. Creek Chub prices were undercut by some competitors who were making shoddier baits. It was decided to offer a lesser quality line of baits that could compete in the second tier market. They dubbed the new line of baits Shur-Strike. When viewed today, many of these lures still retain their brilliance & quality finish. Although CCBCO didn't finish these lures with the same standard of excellence as their regular line, Shur-Strike lures still exhibit a quality that far exceeds other bargain lures. Most of the Shur-Strikes were offered under other sporting house brand names. Large retailers such as Montgomery Ward, Sears, Western Auto plus local & regional stores sold Shur-Strike lures under their own trade names. Around the same time Creek Chub also entered into an agreement with a large Canadian company, Allcock, Laight & Westwood Co. They produced & offered a huge array of sporting equipment. 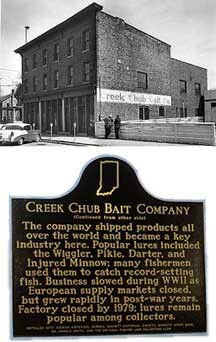 Although their arrangement with Creek Chub survived for many years, the exact details of production & sales remain unknown. Their paint patterns & lure hardware are different than Garrett products, so many believe the lures were finished in Canada. The change to a reinforced lip occurred on several baits in 1936. Also, a wire ran from the lip through the body & out the tail was added on some larger bodies for added strength. This hardware is known as through-wire rigging. Approximately 16 new lures were added to the line in the late 1930s. Several of these lure series are known as hair baits. They incorporated dyed horsehair for the lure's tail or "legs". Soon after WWII effectively ended in 1945, the servicemen came home in hoards. An untold number wanted to partake in their favorite pastime of fishing. Unfortunately, although the demand was overwhelming, CCBCO wasn't able to respond to the orders for several reasons. The glass eyes had been imported from Germany before the war so there was obviously a supply problem. The hooks were from Norway & England so it would also take time for a new supply of them. Metal for the lips was also in short supply due to the war effort. In earlier days CCBCO would occasionally take direct lure order from customers. This was also changed during these years because the company was backlogged with orders for 18 months! A new Deep Diver lip was inaugurated in 1950 as an option on several baits. A special size box was made for some of these lures. Just as the name implies, these longer metal lips enabled the lure to run deeper in the water. During the same year the company brought to the market two new fluorescent colors in bright hues (Rainbow Fire, Fireplug). These lures glow under a black light. They were discontinued within 5 years. 1951 was another watershed year for the company. Harry Heinzerling, the son of Carl, was hired two years before. He quickly proved his worth as a master salesman for the company. He persuaded the directors to offer a new line of baits geared for the spinning reel market which was the latest sensation of the fishing hobby. These reels could handle smaller baits easier than bait casting reels. A line of spinning baits were thus introduced, known as The New Creek Chubbies. CCBCO housed these baits in a newly designed plastic top box, which made it easier for the customer to view the bait while on display in the store. The 1950s also saw a myriad of large saltwater baits added to the line. Eventually many were discontinued in the late 1950s due to a shortage of White Cedar. Harry Heinzerling also realized that plastic lures were necessary for the continued growth of the company. When many of the cedar baits were discontinued, the plastics often took up the slack in sales. By 1960, glass eye baits had their final swan song (with a few exceptions). During the 1960s & 1970s wood & plastic baits of the same series were sometimes produced in tandem. Some ultralight lures were produced for the lightweight spinning tackle. The large color catalogs & smaller pocket catalogs (placed in lure boxes) were already a product of the past. Smaller flyers & 2-3 page color price sheets were the order of the day. In retrospect we can see a definite economizing by the company. Over the years CCBCO introduced over 75 CATALOG color combinations & more than 145 different standard lure models. Some of these colors & lures were made for a very short time while others were offered for decades. Creek Chub would actually take direct orders for a time from stores or individuals for custom color combinations. These are known as "Specials." Today they are highly collected by Creek Chub specialists. By nature, they are rare, desirable & often expensive. The breadth of color & hardware combinations is unending for Specials. Creek Chub even sampled the metal lure field starting in the 1920s. They were never made in the quantities or selection as the wood or plastic baits. Harry decided to retire at 70 in 1978. His relatives & the other founder's descendants had established other careers & weren't interested in running the business. Therefore, when Harry retired the company closed, too. Most of the equipment, company name & supplies were sold to the Lazy Ike Corporation and was moved to Iowa. Herein is a capsule history of this well-known tackle company. Over the decades there are untold numbers of other interesting facts & human-interest stories which can't be adequately covered in this space.